“Anaheim based” company Morgan Drexen is starting the new year with a celebration, as they are recognized for their innovative support services by bankruptcy Trustee Jeffrey Golden. Southern California Trustee and Super Lawyer Jeffrey Golden, has petitioned a Californian court to approve using the legal and automated support services of “Anaheim based” Morgan Drexen. Legal Support service and outsourcing is a familiar concept to many entrepreneurs. Companies throughout the world routinely outsource their payroll processing, accounting, distribution, and many other important functions. Many large companies turn to outsourcing to cut costs. In response, entire industries have evolved to serve companies' outsourcing needs. Initially Morgan Drexen will be responsible for the documentation of over 500 new trustee clients. Morgan Drexen uses state of the art technology partnered with Legal Intake Specialists and paralegal support staff. Morgan Drexen services more than 50 attorneys nationwide. 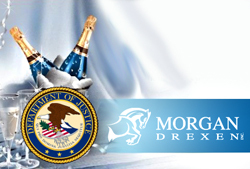 Morgan Drexen prides itself on training its staff with more than 20 paralegals qualified in 2010. Ledda believes providing customer service of the highest quality has been the secret to Morgan Drexen’s success.